An extended and uncensored version of Agony, developed by the authors of the original title - Madmind Studio. In addition to improved textures and models, Agony Unrated has introduced a number of graphical and gameplay improvements. 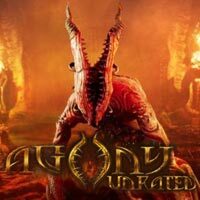 Agony Unrated is an expanded and uncensored version of Agony, developed by the authors of the original game, i.e. the Polish team Madmind Studio. Contrary to the original, which came out on PCs and consoles, this version of the survival horror title appeared only on personal computers. In Agony Unrated we take on the role of a soul which, after it has reached hell, must find a way to escape. During the game, we learn about the identity and the past of the protagonist, as well as the reasons why he was sent to the depths of hell ruled by the elusive Red Goddess. Additionally, however, the game offers an opportunity to trace the story from the perspective of a Succubus, in the shoes of which we do not have to look at the limitations that bind the soul of a common martyr. In Agony Unrated we observe the action from a first-person perspective (FPP). The core of the game has remained unchanged from the original, so during the game we are going through terrifying places, trying to avoid direct confrontation with the demons inhabiting them (although a martyr controlled by us can now set fire and kill some adversaries) and we solve environmental puzzles. The hero's ability to possess the creatures he encounters helps him to survive - although initially, it is possible only with people, over time the character gains also the ability to take control of some demons. Hell has been riddled with deadly traps, as well as new types of opponents standing in our way. In addition, the authors improved the character development process and introduced eight endings to the story. Additionally, during the game, we can use a minimap. In addition to the story campaign, which we can complete at a normal or high level of difficulty, Agony Unrated offers two additional modules (Succubus and Agony modes), which are available from the very beginning. Agony Unrated is powered by the Unreal Engine 4 technology, thanks to which the graphics of this production show decent quality. Compared to the original version, the title stands out due to uncensored textures, character and animation models, as well as two filters (black and red), which can be applied to the image. In addition, the game contains all the scenes that were cut from its basic version.